Prototype:French State Railways (SNCF) class 422 200 dual system locomotive. 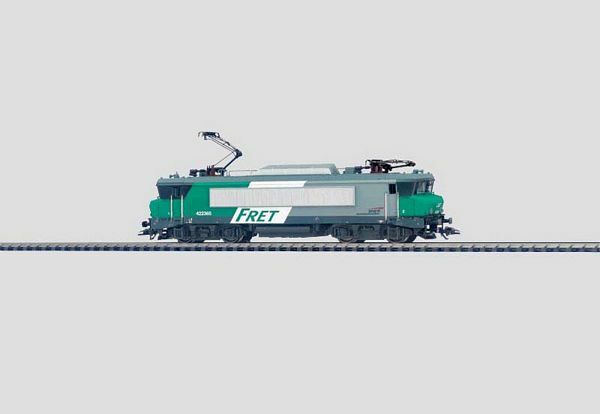 Version for freight service (FRET). Former class BB 22 200. Model: Comes with a Digital decoder, controlled high-efficiency and a sound effects generator. 2 axles powered. 4 traction tires. Headlights will work in conventional operation and can be controlled digitally. Sound effects of a horn as well acceleration and braking delay can be controlled digitally with the 6021 Control Unit. Length over buffers 21.0 cm / 8-1/4. Model has the current paint scheme for the prototype. Adjustable high-efficiency propulsion:Model is suitable for heavy trains and for express trains. Horn can be activated digitally (with 6021).